This ones for you Ali boo! Tonight our three year old Ali had a hard lesson in making choices and consequences of those choices. Threenager fit number one under our belt! It’s the first really nice day we’ve had in a few weeks and we were excited to get the bikes out and go on a bike ride! We put the kids in their bike trailer and they go with. As we were getting through supper our little Ali wasn’t eating much – basically had maybe two bites. We both asked her numerous times to eat her supper – and she didn’t eat much at all. Just a lot of playing and singing like a typical 3 year old. So when it was time to go on a bike ride Mr. Jake got to go with daddy while mom and Ali stayed home. She cried the entire time they were getting ready to go, while I put away supper, cleaned up and while I brushed her teeth and put her Jammie’s on. I also warned her if she didn’t stop crying she’d go to bed early. With crying long enough to make herself go horse an early bed time it is! I talked to her about the choice she made to not eat supper and sometimes we make choices we aren’t happy with and we just have to deal with those consequences. She was still not happy with the outcome. I’m sure there will be a lot of lessons like this in our future. Both of us learning lessons as we go! 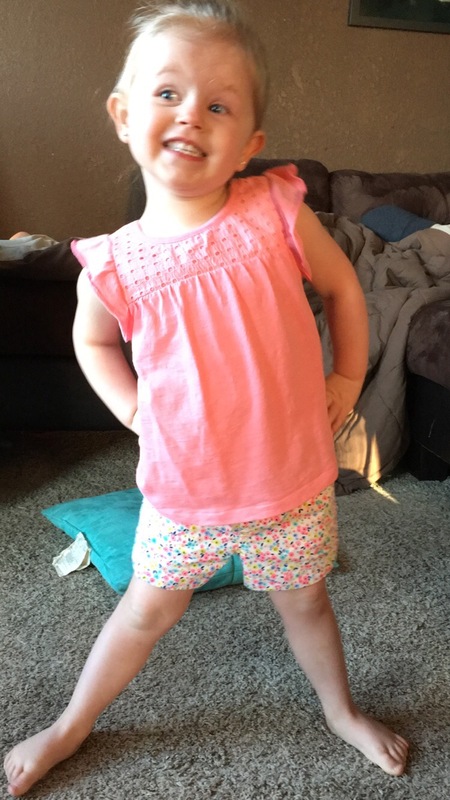 This sassy little girl is just like her momma! I hope some of you were able to get out and enjoy the wonderful weather tonight!